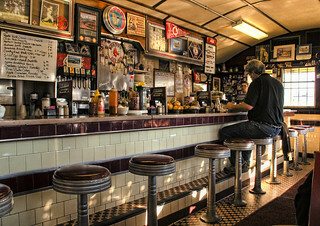 The Miss Worcester Diner on Southbridge Street was built in 1948 by the Worcester Lunch Car Company, which was nearby. Recently, it reopened after changing hands and being renovated. It serves good diner food and is busier than this picture suggests. I waited for a lull in the crowd to take this picture. Currently, the diner is listed in the National Register of Historic Places. Worth a trip if you are anywhere near Worcester. If you view the large size, you can read the specials menu.